Don't overlook your van's security. Owning a van can sometimes mean you have to store and transport expensive equipment and tools. We’ve created a short guide with some handy tips and tricks on keeping your van and its contents safe and secure. Having branded livery on your van can be a great way to advertise your business. However, it’s always worth considering the line of work you’re in before branding your vehicles. Many professions are known to carry expensive equipment and tools, and you might not want to attract attention to potential thieves. This one is almost so obvious that it’s easily overlooked. An alarm is especially effective if you’re leaving your van in an urban area because people are more likely to hear the alarm going off. Having a visible alarm system fitted to your van can also act as a deterrent. Fact:Ladders are the most common items stolen from vans because they’re usually left on the roof, and unsecured. Clamp the ladders to the roof of your van to avoid them being stolen. A secure partition behind the driver and passenger seats can serve as an easy security method and an effective safety feature. It means the contents of your van will not be visible from the outside, making it less attractive for potential thieves. A secure partition also means that, if you have to brake sharply, the contents in the back of the van can’t come through to the front. Having a security box bolted to the floor of your van will give you peace of mind knowing your valuables are safely locked away. This is especially useful if you have to carry cash in transit or have equipment that you need to store in your van overnight. Top tip: Mark your equipment or tools with your name or the name of the business. It’ll make it harder for thieves to sell them on and may prevent them from being stolen in the first place. There are loads of ways to do this but the most popular and effective methods are engraving or etching. You might want to park far away from parked cars or traffic to avoid your van being knocked or scraped. 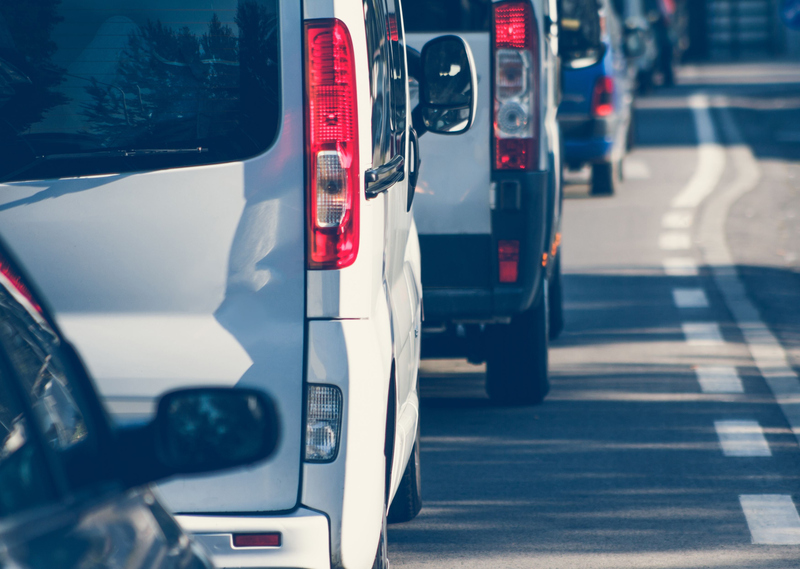 But you’re better off parking in busier areas like the front of a shop or parallel parking on a busy street to reduce the risk of your van being stolen. When you’re parking at night, try to do so in a well-lit area and avoid secluded industrial estates and public car parks. Satellite vehicle tracking is becoming more popular, especially for commercial vehicles. it’s not as expensive as you might think and is a worthy investment for your business. The tracking device is fitted inside your van and submits a signal allowing the van’s exact location to be tracked. If your van was to be stolen, you’d have a much better chance of getting it back in one piece if you have a tracking device fitted. In the market for a new van? We’ve got loads of new and used models at competitive prices. Click below to browse our vans.